Ayssa Villarreal, 20, of Weslaco wears a gold halo that was inspired by Byzantine art. 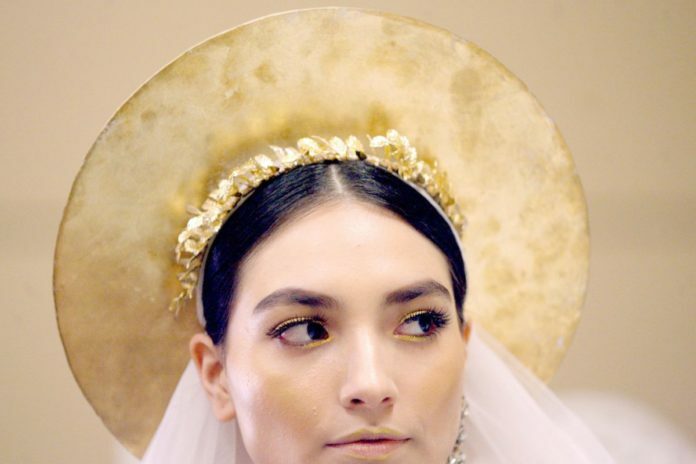 Artists would create religious paintings and guild the images with gold leaf, including halos, which inspired Manuel Tiscareño’s latest collection, “Acanthus,” which he showcased during a bridal fashion show April 13 at the McAllen Convention Center. After landing in the pages of Harper’s Bazaar en Español, there’s nothing quiet about Tiscareño’s growing bridal couture business. One of his gowns was featured in a four-page spread — including the interior cover — inside the magazine’s April bridal edition. The exposure in Harper’s Bazaar, he said, generated interest from a bridal fashion week in Mexico City, which would give his brand even more recognition. “In 10 years, I want to see Tiscareno Bridal Couture impact the lives of as many brides as possible,” the designer finally answered the question. He’s on that path with five show rooms for his custom bridal business on both sides of the border by the end of spring. Tiscareño was also contacted by someone in Liverpool, England to sell his gowns in their store. It would be the first time his dresses would be up for sale in Europe. That potential buyer became interested after coming across Tiscareño’s Instagram account. To go along with his custom bridal business, he owns Von Lei Bridal, a wholesale line of dresses available in his studio and 10 stores in Mexico. Tiscareño, originally from Aguascalientes, Mexico, also owns a wedding banquet hall in San Juan, where he moved with his family when he was 6. On April 13, his latest collection — inspired by Byzantine art — was revealed in a fashion show at the McAllen Convention Center. The show paid homage to his mother, Laura Medina, who died last month. In that dream, his mother was in the fashion show with a halo. The model of the finale dress of the show was stylized with a halo ala Byzantine art. Manuel Tiscareño’s publicist lends his collections to showrooms in Mexico City. From those showrooms, stylists pick them up. If they like them, they will use them for editorial shoots for various magazines, and Harper’s Bazaar en Español happened to be one of them. The four-page spread inside the magazine’s April bridal edition, which featured one of his wedding gowns, was the biggest publicity so far for the up-and-coming local bridal couture designer. As the April edition of the publication hit the stands, Tiscareño was planning a bridal runway show April 13 at the McAllen Convention Center, where he introduced his latest collection, “Acanthus,” a Byzantine-art inspired group of wedding gowns. He came up with the idea for the collection after dreaming about it. From that dream, the fashion show began to take shape and became a reality.